Here's what you need to know if you're thinking of joining the wave of plan sponsors that are de-risking by making lump-sum offers to participants. In recent years, many defined-benefit plan sponsors have made lump-sum offers to terminated, vested participants as a de-risking initiative, and many others are considering the move. In order to determine whether it’s an appropriate strategy for any particular plan sponsor requires an awareness of the sources of plan risk, the move’s impact on funded status, the program costs, and the remaining plan’s characteristics after the lump-payouts. Recent regulatory changes increased current and future Pension Benefit Guaranty Corp. premium rates, directly impacting the potential cost savings from a lump-sum offer (see Table 1). Plan sponsors are choosing to counteract the increases by reducing the plan size by implementing terminated vested lump sum programs. Also, a more indirect way of increasing variable rate premiums was among the funding-relief components of MAP-21 and subsequently the Highway and Transportation Funding Act of 2014. The Society of Actuaries (SOA) recently released updated mortality assumptions that will recognize greater expected lifetimes and thus meaningfully increase the value of liabilities for most plans. Accounting liabilities reported in the most recent financial disclosures likely reflect the new mortality assumptions. T the IRS has yet to publish regulations on when any changes would affect funding liabilities and lump-sum calculations, but it could be as early as for 2017 plan years. If terminated vested participants take a lump sum before those increases have an impact, future funding liabilities and contributions may be reduced. When deciding whether to offer a lump-sum program to terminated vested participants, plan sponsors should review the individual plan considerations that may make such programs more or less attractive. Plan changes may be required, and cash balance formulas can bring unintended complications in the areas of plan funding (i.e., plans that offer lump sums have to comply with certain funding-ratio requirements) and administration. Further, clearly communicating the program to participants is very important. Human resources, legal, and other outside consultants are likely to be involve, which can drive up the costs of a program. Overall, the total cost of the lump-sum offer can vary widely, and evaluating it can be a more complex exercise than a plan sponsor might initially anticipate. When evaluating the potential financial impact of a lump-sum offering, there are many key measures that can provide insight into the decision. 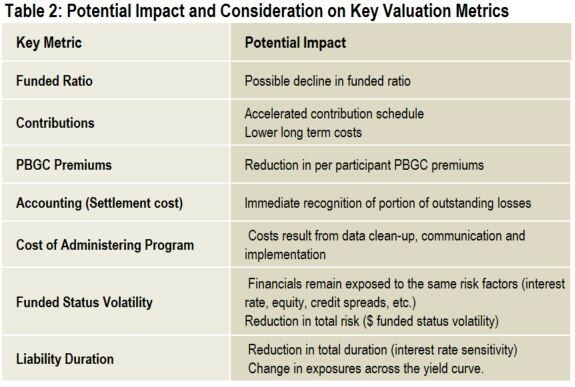 Table 2 provides a summary of the potential impact for a number of key metrics. 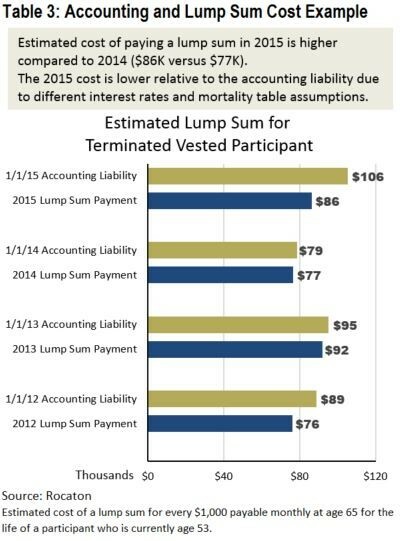 The impact of lump sums on funding and accounting liability metrics can be different, due partly to the interest rates and mortality assumptions used in each calculation. For funding liabilities, rates are typically averaged over 24 months but are currently limited by a floor (determined in part by rates averaged over 25 years). Discount rate methodologies for accounting purposes generally reflect a more marked-to-market approach. Liabilities used in the most recent financial disclosures likely incorporate some of the SOA’s increased longevity assumptions, even though the IRS has yet to require changes in such assumptions for purposes of funding liabilities and making lump-sum calculations. Rates used to value lump sums are one-month averages based on the plan’s lookback and stability periods (found in the plan documents), which are often reset only annually. Occasionally the timing of the lump sum can lead to favorable outcomes. As illustrated in Table 3, in 2012 a plan that offered a lump sum may have settled for less than the liability held on financial statements (due to the difference in the stability rates and the discount rate). Plan sponsors need to understand the interest rates and mortality assumptions used for each calculation and their potential outcomes in order to make a well-informed decision. In order to execute a lump sum, a significant portion of the assets are paid out of the plan. There are two main questions to consider here. First, which assets will be taken out of the plan, and when? Second, what should the plan’s asset allocation look like going forward? It may seem straightforward to pay lump sums by reducing the allocation to liability-hedging assets such as long bonds, since those assets are there to match liabilities that would be removed from the plan. What may not be as intuitive is why this will likely introduce more risk into the plan. A terminated vested lump sum offering involves a cost-benefit analysis of the program and a thorough review of the plan’s risks before and after lump sums are paid. Reviewing the risk structure of the remaining plan is pivotal because the lump-sum program settles only part of the liability and leaves a plan sponsor with a different plan to manage in the future. Joe Nankof is a founder and partner of Rocaton Investment Advisors, an independent institutional investment consulting firm, advising on approximately $440 billion in assets. Members of the firm’s pension risk management team co-authored this article. Click here for a longer version of this article on Rocaton’s website. Rocaton is registered as an investment adviser with the U.S. Securities and Exchange Commission. Rocaton’s Form ADV, Part 2 is available upon request. The information included in this publication has been taken from sources considered reliable. No representations or warranties are made as to the accuracy or completeness of this information and no responsibility or liability (including liability for consequential or incidental damages) is assumed for any error, omission or inaccuracy in this information. This information is subject to change over time. This publication is not intended as investment or actuarial advice. Before acting on any information contained in this material you should consider whether it is suitable for your particular circumstance and consult with your actuary. Any opinions expressed in this publication reflect our judgment at this date and are subject to change. No part of this publication may be reproduced or redistributed in any manner without the prior written permission of Rocaton Investment Advisors, LLC.